This man is not attempting to impale himself (and he didn’t), he is trying to get to Parliament. It’s not just rainy season now, it’s protest season. Or maybe it’s always protest season. The name of the protest- Occupy Parliament- is a bit misleading as the protest is not inside Parliament, but on the streets outside. Though Parliament was disrupted inside and outside. The yellow shirts blocked Parliament to prevent a vote on a national reconciliation bill, they succeed. As you can see from the picture, it was not easy for an MP to make it into the building, all roads and streets were blocked by the protest. 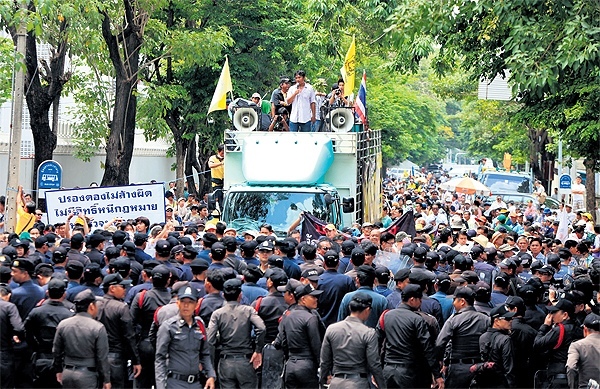 This entry was posted in Politics and tagged Bangkok, protest, Thailand, yellow shirts. Bookmark the permalink.